The title, The Eighth Climate: (What does art do? ), presents a parallel paradoxical pairing of the epic with the banal. The Eighth Climate, a concept devised by 12th Century Persian theosopher Sohrevardi, is as expansive as it gets: it refers to an ‘inter-wordly’ perceptive zone. Straddling the real and the mystical, it points to that which falls just beyond our ability to perceive or understand. To the state of the visionary. In pertaining to answer the comparatively well-trodden art historical qualm, ‘what does art do?’ Lind continually returns to the visionary nature of those contemporary artworks, collectively displaced in the zone of the biennale. This brings us to the question, raised by Lind and others on the curatorial team (an all-female cast consisting of curator Binna Choi, assistant curators Azar Mahmoudian, Margarida Mendes, Michelle Wong in collaboration with local curatorial associate Mite-Ugro): given the curatorial emphasis placed upon the artworks’ inherent uncontainability and generativity, and given that the biennale setting serves to amplify this through its own chaotic and unpredictable inter-relations, how is such an expansive project ‘embedded’ within and ‘mediated’ through the locale of Gwangju? What is drawn out by this specific context? Lind’s introduction to the catalogue (energetically designed by Metahaven) describes South Korea as ‘split between progressive tendencies and conservative forces.’ Within this context, and whilst anchoring the long-term research phase in the local context, Lind sees contemporary art as offering the potential to suggest ‘otherwise.’ Setting this in motion, the first 25 artists were invited to make site visits to Gwangju in September 2015, almost immediately after Lind’s tenure began. 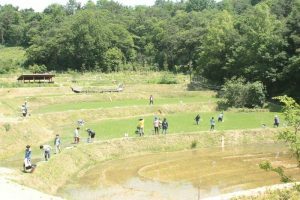 They undertook year-long commissions involving on-site research, taking into consideration local materials, traditions, histories, techniques and skills. 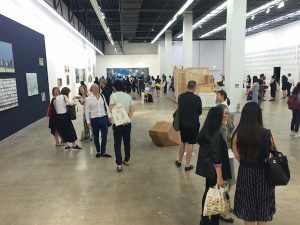 The emphasis placed on commissions – which constituted 28 out of the total 250 artworks produced by 101 artists and groups – acted as a generative starting point. Further invitations, novel ‘strands’ and a multiplication of ‘themes’ began emerging. 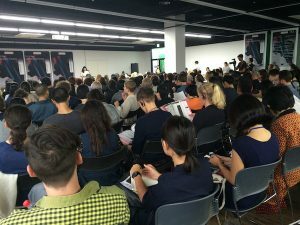 Nearly 70 representatives (from roughly 100 invited ‘Biennale Fellows – small to mid-scale non-profit arts organizations from around the world) were brought together for the opening weekend Forum held on September 3rd and 4th. With the artworks now in place, the fellows were invited to relate their broader experiences of operating within this ecosystem to questions of ‘value, continuity and scale.’ These pertain to broader questions of translateability, implicit in the exhibition’s title. As the 20th Century French philosopher Henri Corbin noted, we must hazard against a too-literal translation of the Persian na-koja-abad, which results in the English ‘land of no-where’ – or in his eyes worse, ‘utopia’. The spatial ambiguity of what the curators refer to throughout the catalogue and conferences as ‘placing art centre stage’ is core to the broader economic and macro concerns explored throughout the conferences. The outward and future-orientation drawn out by the biennale team’s curation emerges in such design quirks as the physical displacement of wall texts into the digital realm (accessible only via QR code on a smart phone app) a new pop up website and app and several off-site projects and sites, most notably Fernando Garcia’s community performance at the Hansaebong Agriculture & Eco Park on the outskirts of the city. The initial selection of artists itself grew from an expansive search – incorporating visits to over forty cities through ten rounds of international and seven rounds of domestic research. This familiar framing was an attempt to calibrate the ‘global temperature’ of art today. The implicit nod towards discourses and issues of climate change is combined here with a concern over the ‘climate change’ facing the art world in the early 21st century. 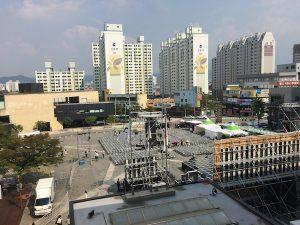 Gwangju itself – despite possessing perhaps the most well-endowed Foundation in Asia – is not immune to those ‘threats’ to the existence of many smaller non-profit arts organisations. 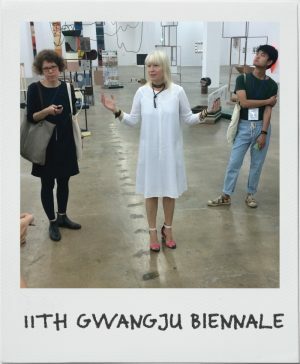 The Gwangju Biennale Foundation’s President, Dr. Yangwoo Park – in the context of city’s booming status as an art world centre (consider the launch of the colossal Asia Culture Centre in 2015) – explicitly points to the need for this year’s biennale to justify its continued relevance to society. This concatenation of concerns of scale is formulated, again, during the forum, through a nuanced discussion of artistic ‘value.’ Some interesting comparisons were made between that which both these smaller, informal organisations and larger conglomerations of activity such as the Gwangju Biennale might strive to create. The dry economics term ‘deferred value’ (developed by researcher Sarah Thelwall) was offered as a particularly apt parallel to the expansive curatorial theme. It refers to the generation of not-immediately-recognizable artistic value, itself something ‘in-between,’ or even liminal. That is, until its (frequent) later usurpation or appropriation by larger organisations, those more comfortably positioned within the global economic roundabout. The decision to host this mega-forum of small and medium sized organisations is quite telling at this juncture in the biennale’s history. As perhaps the first time many of these disparate organizations have met in one place, participants and delegates were able to catch a glimpse of the emerging ‘language’ through which both institutional and artistic precarity and potentiality might be understood – including how this plays out in the context of Gwangju where such threats also make their presence felt. Whilst this drew directly on Lind’s own research and writing in the area, she does not herself purport to be able to read or speak this ‘language.’ For the 11th edition of the Gwangju Biennale, Lind has consciously evaded the curation of any easily recognizable ‘spectacle.’ Instead, where the ‘spectacular’ does arise, it is in the context of the rather ambivalent contemporary nature of a mass artistic platforming. 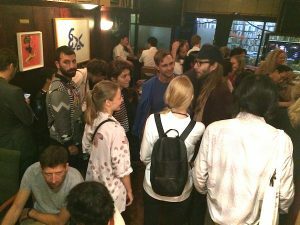 Whether as a participant in the opening night’s karaoke gathering, or akin to one of the unusually multiplicitous light-based features in the biennale’s dark room (in Gallery 2, perhaps the most memorable part of the exhibition), members of this growing international artistic community were provided with a space for contact and exchange, catching glimmers and incomplete or not entirely ‘translatable’ glimpses of each others’ practices, modes of survival (dance moves), and plans for the future. Shwetal A. Patel is a founding member of Kochi-Muziris Biennale and PhD scholar at the Winchester School of Art, University of Southampton. Henrietta Landells is a London based writer, researcher and curator. Graduate of Oxford University (Anthropology) and the Courtauld Institute of Art (Documentary Media). Would you like to see your own report from a biennial published on our website? Learn how HERE.